After completing my third tri ever over the weekend and my first 70.3 I thought I would impart a chunk of the pearls of wisdom I picked up. I entered the event due to location and price (it was cheap and close) but it had its shortcomings in terms of route on both the bike and run courses. 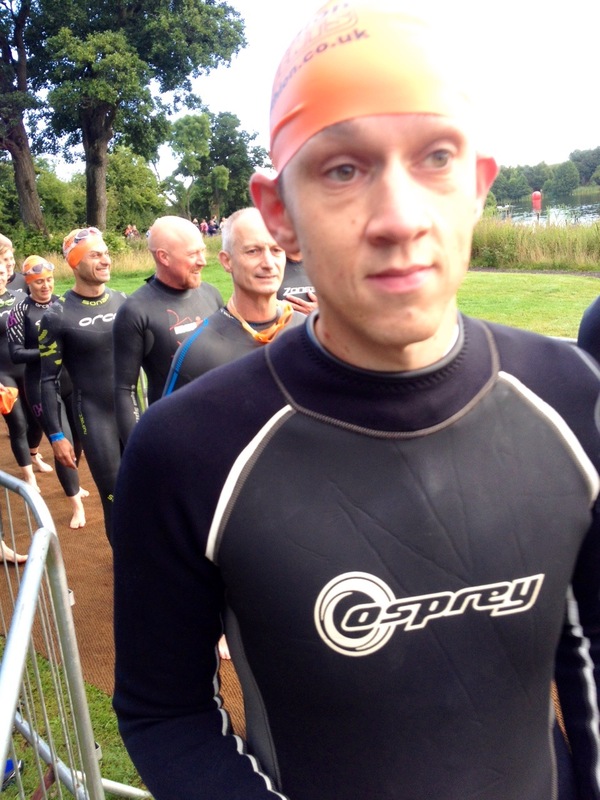 So far so good – we had to all go back into transition to start the official walk down to the swim entry – god only knows why they gave us an athlete’s parade down to the water’s edge – everyone I spoke to said they found it quite embarrassing and pretty pointless. So to the deep water start and the crystal clear waters of Dearnford. Yeah right. Having swam there a couple of weeks ago I knew it wasn’t going to be as clean as advertised but I wasn’t prepared for the stench of farm slurry that the water smelt off – it was utterly rank – I hate to think what was in there, but I couldn’t see my hand in front of my face whilst I warmed up. So the horn goes off and carnage starts something which would continue for most of the first 900 m lap – due to the nature of the course there would be lots of right handed turns around buoys and so lots of bottlenecks to contend with. I managed to settle into a fairly smooth rhythm quite quickly, despite the grabbing and scratching of my legs and the fact that the weeds were still out in force in the lake. First 3 or 4 turns were just as bad as at the start people swimming into / over the top of me – some of the slower swimmers who had started at the front causing issues by changing to breaststroke and causing mini underwater pile ups. First realisation that the swim had gone well for me was the number of bikes still in T1 – I had had a recurring thought that I might be towards the back after the swim as I haven’t really had a benchmark from my OW swimming as hardly anyone does 2k where I swim. So in the excitement I forgot where I had parked my bike which cost me a little time but everything else went smoothly enough and I was out on to the bike – managed to get the feet in the shoes without to many issues, quick drink and I was away onto the course without further issue having spent 2 mins 30 in T1. As previously mentioned I knew the bike course, as its part of the road I drive to work 5 days a week. So I knew what to expect – bumpy, busy and chaotic. It was definitely all of those things but I wasn’t prepared for the drafting by fellow competitors – it was rife and massively annoying to watch. The course was fairly loopy in design, so lots of roundabouts and switchbacks so you can see fellow competitors and gauge how the day is going. Being new to this still I was delighted ( actually I was f*cking made up) to calculate that I was somewhere within the top 35 riders – clearly everyone was having a bad day  – but the striking thing was the peloton style riding that groups were doing. I get the whole 10 metre, 15 seconds rule and I attempted to apply it every time I either approached someone or got overtaken, but its very disheartening to watch people ignore the rules – apart from by feed stations – and just ride as if in a sportive event nose to tail. It got to the point where I just assumed that we were allowed to draft and asked marshals along the route for confirmation on it, but no one could confirm or deny it (afterwards I asked and you weren’t allowed, as per normal) so I just stuck to my plan of working through the course and not following suit. The roads were increasingly busy as the morning progressed and I and a couple of others almost came a cropper when a lorry got fed up and decided to attempt a stupid overtaking – this left me staring at the back of said lorry for about a mile ‘enjoying’ the diesel fuels, nice to be able to draft it though…. So round the massively tight turn around point and out on to the second lap of the route. Saw my wonderful noisy wife shouting and screaming for / at me on a roundabout and it give the legs an extra kick. I did a situational check and all in all everything was going about as to plan as possible, I had been sticking to my fuel plan, my legs felt ok the bike was being its usual fantastic self. At this point I was on for an above expectation swim and bike and this fuelled the legs some more to keep the, for me, decent speed. Nothing really happened for the rest of the lap, a few more pelotons flew past me but these were guys doing the full ironman distance event – clearly cheating takes place at every distance. The only other thing to note from the bike was the littering that everyone was doing – gel wrappers, cake wrappers, empty bottles (one of which I saw thrown at a car, I assume by mistake) with people clearly not caring about the effect on the countryside they were riding through. (I drove part of the route this morning to work and there were loads of litter still kicking around and tons of red high 5 bottles on the verges) I am not a tree hugger but surely its not much of an effort to bin bottles and rubbish at feed stations like I managed to do? Back into T2 and again extremely happy to see not that many bikes in there, didn’t really have a clue how I was doing vs. others but I was only ever racing my previously fat(ter) self. 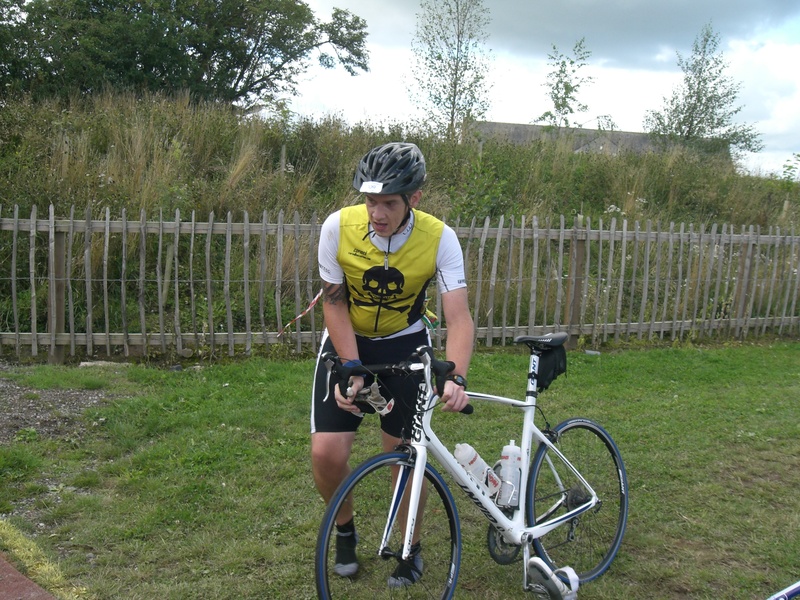 Bike split was 2:42:36 which I am delighted with and it turned out to be the 44th fastest overall. Another quick change and I was away having spent 90 seconds in T2 – it appears the bits of triathlons I am best at are the ones which don’t involve much movement! I very quickly realised that the 13 miles were going to be a painful experience. This would be the furthest I had run off the bike and in the Olympic event I did in July I struggled to stay hydrated – this time the plan was to run to every feed station – walk the station and drink two cups of water then run again. I did this for about 95% of the run course and only twice did I walk for sections in-between them. The plan didn’t massively work though as I still had such a dry mouth that my gums and lips felt like they were sticking together and I could only muster a little encouragement back to the shouts from the supporters in acknowledgement of my pirate top. Also I started to get a bloated / sick feeling which I assumed was the sheer amount of fluid in my system at that point. Think a few had similar issues as I saw two guys throwing up against a wall – who says tri’s aren’t glamorous. The run course was loopy and included back and forth sections – which were clearly designed to just make up the distance – most of which were on grass and around the lake. I saw someone cut about a mile of the first loop and reported him – whether it was on purpose or not I don’t know but the route was clearly marked and he ignored the shouts from the marshals that he had gone the wrong way (turned out a few people cut the bike route to) so hopefully he will get time added or DQ. Throughout the run I was in pain but determined to just keep plodding slowly on and aim for sub or around 2hrs and that would bring me comfortably under 6hrs – which was my target. I can’t really remember a lot of other details about the run – I saw my family and gave my daughter a sweaty kiss at the end of the first lap (a lap I did in roughly an hour, so bang on pace – I was close to tears when I knew I was within a mile of completing the event but managed to kick on, kept the emotions in check and when I saw the finishing chute and the announcer quoting my name and number I was properly borderline on the point of tears (I don’t care if anyone thinks I am a wimp) ran over to my daughter (complete in her pirate fancy dress costume) picked her up and walked across the line in a provisional 72nd place after 5hrs 24 minutes. The run took me 02:06:21 so over where I ideally wanted to be and highlights where I need to improve. The run being the 143rd fastest of the day. As soon as I stopped my legs gave up and I was close to decking it, complete with child, even before getting the medal. No words to describe how amazing and yet utterly completely drained I was, having my family there saying they were proud of me and I had done well almost started the tears off – but despite my mum crying on my shoulder I didn’t blub  I honestly don’t think that I could have run / walked another 500 metres at that point – soon after I laid down and closed my eyes and the world started to spin in a drunken esq manner – I must have been making some funky noises as a marshal came over to make sure I was ok. I will be interested to see what happens with the results in regards to people cheating through drafting, taking short cuts etc. 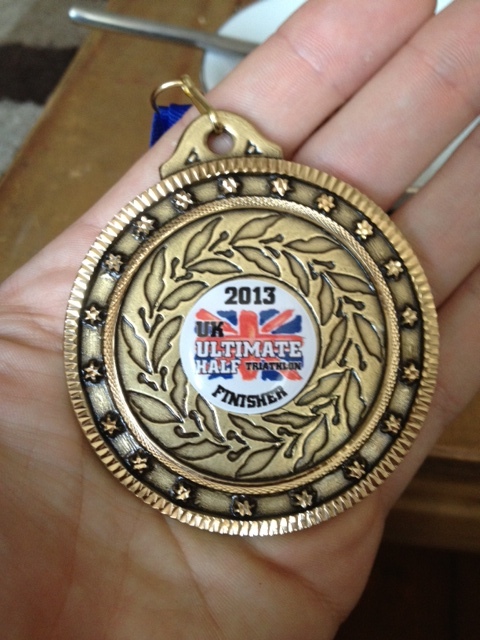 but I was only ever racing to finish and hopefully finish under 6hrs. the fact that on twitter beforehand I had put if I had an A+ day I would be around 5:30 and the fact I went under that was incredible. 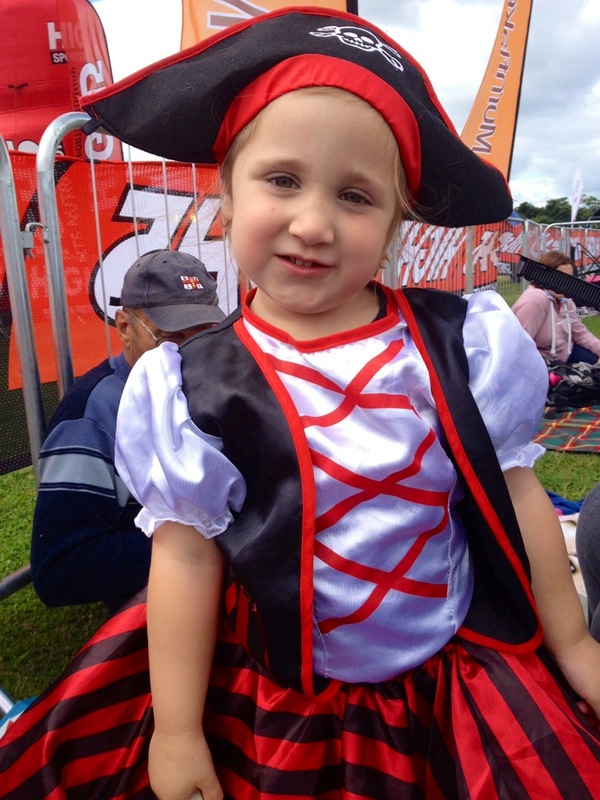 It was my first event in a pirate top and it certainty lived up to my expectations that’s for sure – encouragement from marshals and fellow competitors was fantastic – as was a fellow pirate who was supporting out on the bike coming up to me and giving me encouragement – little things like that help massively. I will be 100% getting my own now as I assume I can’t keep the borrowed top for ever. 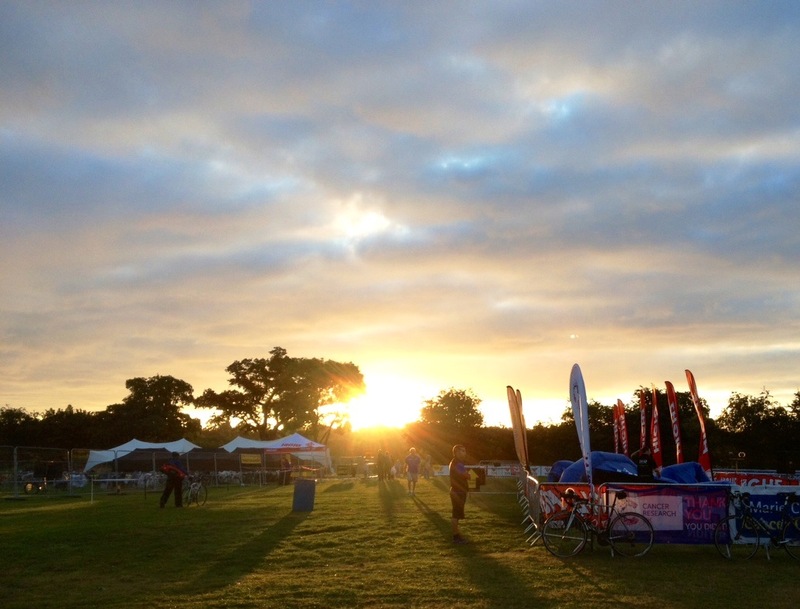 To be honest I wouldn’t recommend the event to others for next year – as I said it was cheap (ish) but the drawbacks about the boring, busy bike and rank swimming conditions means I would look elsewhere. I guess as I am still a, ahem, a fairly robust lad my running will always be an issue in terms of speed. 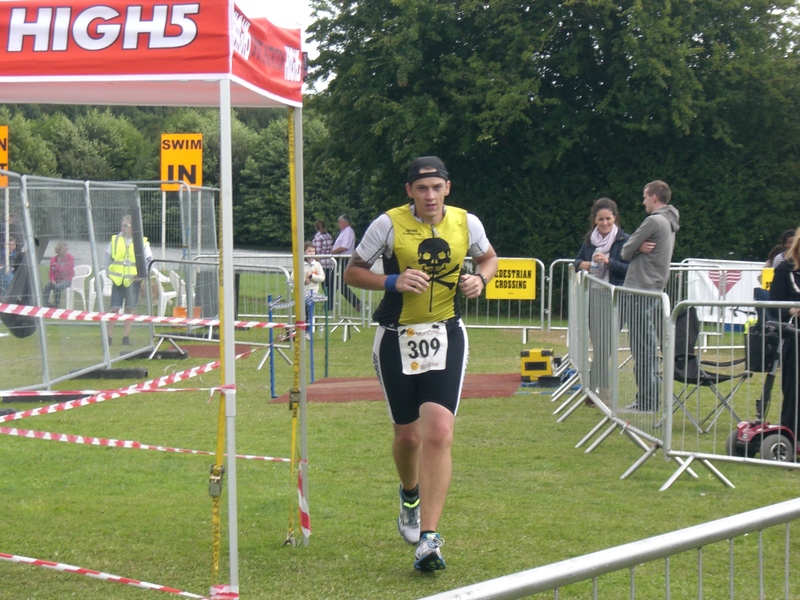 In the three triathlons I have done to date, on each my running has been subsequently slower in comparison to my swim, bike and transition timings. That said I tend to run 6 or 7 mile routes as standard and have only run into double digits 7 times in my life – my HM PB is 1.49 so the drop off to the time at the HIM of 16 minutes to me isn’t that bad, god knows what it would be if I was doubling up. Most people say take your HIM time, double it and add 2hrs for what you are likely to get for the full distance – so that would put me in the 13-14 hr. category and you know what. I would bloody well take that right now if offered.